Via Sharon Sanders at FluTrackers this morning we get the following bare bones report of Guangdong Province's 1st H7N9 report of this winter season, and only the 3rd we've seen come out of China since October 1st. Today's report comes from Zhongshan City (pop. 3 million), which lies close to both Macau and Hong Kong. According to the statistics of "China Disease Prevention and Control Information System", as of February 10 at 0:00, in 2018, 1 case of H7N9 case was reported in our province (Report of February 10 from Zhongshan City). Surveillance showed no evidence of H7N9 virus changes in human infectivity, virulence and interpersonal transmission. 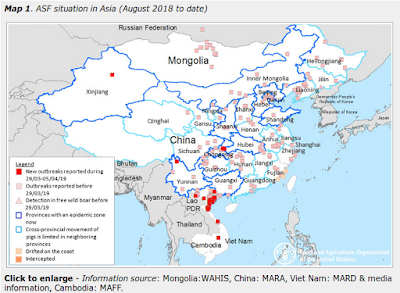 Experts suggest that the overall mortality rate of H7N9 patients is about 30-40%, annual winter and spring season for the susceptible season of H7N9 and other avian flu. The public should avoid contact with dead poultry in their daily life and try to avoid direct contact with live poultry. People in rural areas should not buy and keep live poultry without quarantine certificate from floating poultry vendors. Those with history of poultry exposure and fever and respiratory symptoms, Should wear a mask, as soon as possible to the local medical institutions, and take the initiative to inform the doctor poultry exposure history. After last year's record setting pace of human H7N9 infections in China (see graph below), this winter's unexpected dearth of cases is a puzzler. China undertook an aggressive nationwide poultry vaccination policy last summer, and has reportedly become more strict about regulating live bird markets, which could account for this drop. It is also possible that last summers widespread A/H3N2 epidemic and the high level of Influenza B in the human population this winter is helping to suppress bird-to-human transmission. Some evidence suggests that a recent respiratory leaves behind some temporary cross immunity to other viruses. Called the Temporary Immunity Hypothesis - and while not entirely proven - it might explain why the last 6 pandemics have all emerged in the Northern Hemisphere in late spring or early summer (see PLoS Comp. Bio. : Spring & Early Summer Most Likely Time For A Pandemic) after the end of the regular flu season. Or perhaps it is something entirely different. Whatever the cause of this year's lull in human H7N9 and H5N6 infections, we'll take it.